The waxy caps are white-spored mushrooms with thick, waxy gills and, frequently, waxy or slimy caps. Under the microscope they feature boring, inamyloid, round to ellipsoid spores and, in most cases, elongated basidia that often measure well over 40 µ long. Two main groups of waxy caps can easily be distinguished in the field: those that tend to have medium-sized to large caps that are convex, slimy, and whitish or dull-colored (shades of dull yellow, brown and gray, with pink making rare appearances)--and those those that have smaller, thin-fleshed caps that are convex to conical, slimy or dry, and often (though not always) brightly colored. These groups correspond roughly to the traditional genera Hygrophorus and Hygrocybe, which were traditionally placed in the family Hygrophoraceae. However, it will probably not surprise anyone who has followed the last decade of mycology that DNA studies have overturned the traditional view of the waxy caps. In particular, a recent, mammoth study by Jean Lodge and collaborators (2013) demonstrates that the picture is much more complex than we thought it was. The waxy cap family, it turns out, contains mushrooms that aren't waxy caps (at least, by traditional definitions), including Ampulloclitocybe clavipes and Chrysomphalina chrysophylla--and the traditional Hygrophorus/Hygrocybe split turns out to be insufficient as a means of explaining phylogenetic relationships in the family, necessitating a host of other genus names: Cuphophyllus, Gliophorus, Humidicutis, and so on. But while our understanding of the waxy caps and their relationships to one another has changed dramatically, the mushrooms themselves haven't changed--and the old-fashioned grouping of "waxy caps" still makes for a handy identification tool, even if the group does not accurately depict their evolution. That's the strategy I've used here, since an identification key that places Ampulloclitocybe clavipes and Gliophorus psittacinus in the same group could only be composed of long sequences of the letters C, G, T, and A (the nucleotide codes that comprise DNA sequences), and would be unusable to anyone but a molecular biologist. L. R. Hesler & A. H. Smith's 1963 monograph of the waxy caps recognizes 244 species in North America, and there is no more recent comprehensive treatment for the entire continent--though treatises for California (Largent, 1985), Nova Scotia (Bird & Grund, 1979), and the Pacific Northwest (Stuntz, 1975) have been developed. In addition, David Boertmann's treatment (2000) of the genus Hygrocybe in northern Europe contains many species which are also found in North America. None of these treatments is supported by DNA evidence, however, and the mycological world awaits a species-level study of the waxy caps that is based on more than their physical features. The recent study by Lodge and collaborators (see above) was focused on big-picture questions like the relationships among genera and groups of species; it did not address individual species concepts. Answering the question "What are the North American waxy cap species and how do we tell them apart?" will require many years, many studies, many thorough and well-documented collections--which is why I encourage you, Dear Reader, to help! Please see the pages on collecting mushrooms for study, describing mushrooms, and preserving specimens for details. Identification of waxy caps ranges from easy to extremely difficult. Some, like the blackening and brilliantly scarlet Hygrocybe conica, are immediately recognizable and distinct. On the other end of the spectrum, there are dozens of white, gray, and brown species separated on the basis of erudite microscopic features. In fact, I had no idea just how many of these boring waxy caps there were before I set about making the key below. There are seemingly innumerable hordes of these snore-inducing masses, and constructing the key took months longer than it should have, since I wrote the brightly-colored-species portion of the key first and then could only stomach working on the others in small groups. Identification features for waxy caps are best assessed with fresh collections of multiple mushrooms. If you have collected a single, tiny waxy cap and you think you are likely to identify it with any certainty, you should probably sit down with yourself and have a talk about realistic expectations (don't do this in public). For better or worse, waxy cap identification begins with a decision about whether the cap is viscid (Mycologese for "sticky" or "slimy") or not--and whether the stem, independent of the cap, is viscid. As many mushroom collectors know, however, sticky caps and stems can dry out quickly. When fresh material is not available, it is sometimes possible to judge a mushroom's former sliminess by inspecting the debris that may have adhered to its surface as a result of being embedded in gluten that later dried out. Ultimately, however, microscopic examination may be required (slimy surfaces usually are usually represented by gelatinized hyphae--for example, an ixocutis on the surface of the cap). The attachment of the gills to the stem is also frequently an important character in waxy cap identification; some species have truly "decurrent" gills that run well down the stem, while others have subdecurrent gills, or gills that are broadly attached or, less frequently, narrowly attached, to the stem. Many waxy caps have distinctive odors, ranging from pungent and foul to reminiscent of almonds, or sickly sweet. In some cases, applying a drop of KOH to the cap surface and/or the apex of the stem can help in the identification process. Waxy caps are pretty boring under the microscope, but micro-features do need to be assessed in many cases in order to successfully identify species. Measuring spores and assessing their shapes is often sufficient--but searching for gelatinized hyphae is sometimes required in order to assess sliminess (see above). And, unfortunately, one of mushroom microscopy's more difficult routines is sometimes required, when the arrangement of the "lamellar trama" (the cells that make up the fleshy part of the gills) must be assessed. In the traditional Hygrophoraceae, the arrangement of the lamellar trama was used to classify all the waxy caps. "Divergent" arrangement (illustrated beautifully here, in the 1963 Hesler & Smith monograph) involves cells that curve outward from a central strand; "parallel" arrangements (illustrated here and here) involve parallel chains of cells; and "interwoven" arrangement (illustrated here) involves, well, interwoven cells. That's all well and good, but creating a cross-section of a gill thin enough to actually view the cells clearly and decide how they are arranged is quite a challenge. A Roman aqueduct section is required, along with a lot of patience and a very sharp razor blade. Good luck. I usually remember some urgent housecleaning or yard work I have to do, just when waxy cap sectioning gets ugly. The key below treats 131 North American waxy caps, and is based on the sources listed at the bottom of the page, as well as my experience collecting and/or studying about three dozen of these species. Rarely documented species (assessed by searching "material examined" lists in the literature and herbarium records on MycoPortal) have not been included. 1. Cap, gills, and stem bruising and discoloring black; cap conic to broadly conic. 1. Mushroom not blackening; cap variously shaped. 2. Growing in sand dunes; gills becoming salmon to red before blackening. 2. Growing in hardwood and conifer forests; gills not becoming salmon to red. 3. Fresh stem slimy to sticky. 3. Fresh stem dry or slightly greasy. 4. Cap whitish to grayish, with blue shades near the margin; gills, stem, and flesh bluish; found in western North America under conifers. 4. Cap not as above; gills, stem, and flesh not bluish; variously distributed. 5. Young cap green or blue, maturing to reddish, orange or yellow; stem slimy when fresh. 5. Young cap not green or blue--or, if green, then stem dry to greasy but not slimy; if cap is not green, stem may be slimy or not. 6. Widely distributed in North America; young cap green; mature cap orange to yellow; basidia up to 45 µ long. 6. Found in coastal California; young cap blue; mature cap red, eventually fading to yellow; basidia up to 60 µ long. 8. Stem usually yellow except at apex; known from the Caribbean and Mexico; spores dimorphic (13-20 x 7-10 µ and 5-7 x 3-4 µ). 8. Stem usually more green than yellow; known from the Caribbean, Mexico, and the West Coast of the United States; spores 8-10 x 5.5-6.5 µ. 9. Fresh cap white, whitish, buff, very pale brownish, or pale orangish (but if orangish, the cap and stem are both glutinous). 9. Fresh cap more highly colored. 10. Stem dry to moist or greasy when fresh. 10. Stem sticky to slimy or glutinous when fresh. 11. Odor distinctive (slice flesh and wait at least 10 minutes). 12. Odor reminiscent of almonds; stem discoloring yellow where handled; under hardwoods; known from Michigan. 12. Odor not reminiscent of almonds; stem not yellowing; variously distributed and associated. 13. Odor reminiscent of cedar. 13. Odor not reminiscent of cedar. 14. Odor sickly sweet, strong; found under beech and other hardwoods east of the Rocky Mountains in late spring; cap usually orangish but sometimes nearly whitish when faded. 14. Odor aromatic, or reminiscent of anise or peaches, not strong; found under conifers in Western North America in late summer and fall. 15. Gills pinkish throughout development; odor reminiscent of peaches; cap evenly colored at maturity. 15. Gills white, at least at first; odor reminiscent of anise; cap developing a yellowish to brownish center at maturity. 16. Growing near melting snowbanks in western mountains; cap normally pink to pinkish but sometimes fading to whitish; gills pinkish; spores 12-15 µ long. 16. Not growing near snowbanks; variously distributed; gills variously tinted; spores shorter than 12 µ. 17. Fresh cap dry to moist or lubricous; pileipellis not gelatinized. 17. Fresh cap sticky to slimy; pileipellis an ixocutis or ixotrichoderm. 18. Gills notched; taste bitter; fusoid hymenial cystidia present; spores 5-6.5 µ long; known from the southeastern United States and Trinidad. 18. Gills broadly attached or running down the stem; taste not distinctive; hymenial cystidia absent; spores variously sized; variously distributed. 19. Gills pale yellow; mature cap 1-3 cm across; spores 5-7 x 3.5-4.5 µ. 19. Gills white to ivory; spores variously sized. 20. Gills close; stem fairly thick (1-2 cm); spores subglobose or nearly so. 20. Gills distant or nearly distant; stem width varying; spores ellipsoid to lacrymoid (subglobose in one species that features a narrow stem). 21. Fresh cap moist to lubricous. 22. Found under conifers or hardwoods; fairly widely distributed in North America; spores 7-9 µ long. 22. Found under hardwoods; known from Michigan; spores 6-7 µ long. 23. Gills nearly distant, broadly attached to the stem or just beginning to run down it; mature cap 1-2.5 cm across; spores 4-5.5 µ long. 23. Gills distant, running down the stem; mature cap 2-10 cm across; spores 5.5-10 µ long. 24. Stem under 1 cm thick; spores 8-10 µ long. 24. Stem 0.5-2 cm thick; spores 5.5-6.5 (-8) µ long. 25. Found east of the Rocky Mountains. 25. Found from the Rocky Mountains westward. 26. Stem usually under 1 cm thick at maturity. 26. Stem 1-2 cm thick at maturity. 27. Associated with spruces; gills broadly attached to the stem or running down it; recorded in eastern North America from Nova Scotia to Michigan. 27. Associated with aspen or birch; gills notched; recorded only from Michigan. 28. Appearing in pine-oak woods over winter in Gulf Coast states; spores 3-4 µ wide. 28. Appearing in oak forests in summer and fall throughout eastern North America and the Midwest; spores 4-5.5 µ wide. 29. Stem 15-40 mm thick; fibrillose veil usually leaving a sheath with a folded-over, ring-like belt on the stem; usually found near melting snowbanks. 29. Stem under 15 mm thick; veil absent; not usually found near melting snowbanks. 30. Gills pinkish throughout development; stem 10-20 mm thick. 30. Gills white, at least at first; stem 3-12 mm thick. 31. Growing in clusters (reminiscent of Clitocybe robusta or Clitocybe subconnexa); gills developing orangish tones with age. 31. Not typically growing in clusters; gills remaining white. 32. Cap evenly snow white. 32. Cap developing a yellowish to brownish center. 33. Cap conic to broadly conic; gills narrowly attached; stem base bruising pinkish red. 33. Cap convex to broadly convex, flat, or shallowly depressed; gills broadly attached or running down the stem; stem base not bruising red. 34. Cap white; cap margin with yellow granules, at least when young; surfaces turning yellow with KOH; found under conifers. 34. Cap white or not; margin without yellow granules; KOH reaction yellow or not; found under hardwoods or conifers. 35. Stem fairly stocky (10-30 mm thick at maturity). 35. Stem slender (2-15 mm thick at maturity). 36. Cap and stem cleanly white throughout development; cortina-like partial veil present on very young specimens. 36. Cap and/or stem usually developing yellowish to orangish or brownish shades with maturity; cortina-like veil not present in young specimens. 37. Stem featuring a glutinous "slime ring" when young and fresh; found under conifers (usually pines); cap usually tinted slightly yellowish; widely distributed in North America. 37. Stem slimy to glutinous but not featuring a slime ring; cap yellowish or not; found under hardwoods or conifers; distributed east of the Rocky Mountains. 38. Stem with a thin fibrillose sheath underneath the gluten; cap evenly yellowish to pinkish buff at first, becoming orangish; spores 8-11 µ long. 38. Stem glutinous but without a fibrillose sheath; cap whitish with a brownish center when young; spores 5.5-8 µ long. 39. Odor strong and fragrant to unpleasant; cap and stem becoming pinkish with age. 39. Odor not distinctive; cap and stem not becoming pinkish. 40. Gills becoming brownish with age; spores 7-9 µ long; found east of the Rocky Mountains. 40. Gills not becoming brownish; spores variously sized; variously distributed. 41. Stem featuring a fibrillose ring; spores 10-14 µ long; apparently rare; recorded only from the Mt. Hood and Mt. Shasta areas. 41. Stem without a fibrillose ring; spores 6-10 µ long; commonly collected; variously distributed. 42. Cap becoming yellowish with age; stem featuring tiny reddish brown points when dried; spores 8-10 µ long. 42. Cap remaining white; stem not featuring reddish brown points when dried; spores 6-9 µ long. 43. Cap red, orange, yellow, or pink. 43. Cap brown, black, gray, purplish gray, olive, brownish, or tan. 44. Cap convex, bell-shaped, flat, or centrally depressed. 45. Cap pink to pinkish orange; gills pink; pleuro- and cheilocystidia present. 45. Cap red, orange, or yellow; gills not pink; cystidia absent. 46. Cap orange to yellow. 47. Stem dry; spores 10-14 µ long. 47. Stem sticky to slimy; spores 7-9 µ long. 48. Gills remaining bright orange throughout development, contrasting with the mature cap color; cap usually broadly conic rather than sharply conic (and usually only so when young); cap dry to moist; stem surface smooth; pileipellis a cutis. 48. Gills not as above; cap broadly or sharply conic; cap sticky to slimy; stem surface becoming fibrillose to stringy with age; pileipellis an ixocutis. 49. Cap broadly conic, sticky to slimy; spores 8-10 µ long, often constricted. 49. Cap sharply conic, sticky when young but soon dry; spores 9-12 µ long, not constricted. 50. Fresh stem sticky to slimy. 50. Fresh stem dry to greasy or moist. 51. Fresh cap red to orange (possibly fading to yellow in old age). 52. Cap yellow over the center only (elsewhere whitish); dried caps becoming orangish; spores 6-8 µ long. 52. Cap evenly yellow overall; dried cap colors varying; spore length varying. 53. Gills narrowly attached; fresh stem merely sticky. 53. Gills broadly attached or running down the stem; fresh stem slimy. 54. Stem white when fresh and young; known only from northern California. 54. Stem yellow when fresh and young (possible fading to whitish in old age); variously distributed. 55. Gill edges often gelatinized; spores very broadly ellipsoid to nearly subglobose. 55. Gill edges not gelatinized; spores more narrow than above. 56. Found in alpine and arctic areas; spores 4.5-6 µ wide, variously shaped but not usually constricted. 56. Not found in alpine or arctic areas; spores 3-5 µ wide, usually constricted. 57. Cap 4-15 cm across, rusty orange; stem 0.5-2 cm thick; under oaks and other hardwoods in eastern North America. 57. Cap smaller (often much smaller) than above, variously colored; stem more slender than above; ecology and distribution varying. 58. Cap dull pinkish orange to dull brownish orange (occasionally with grayish or olive shades mixed in); odor often, but not always, fishy or reminiscent of burned rubber; gill edges often gelatinized; filamentous cheilocystidia present. 58. Cap a brighter shade of orange or red; odor not distinctive; gill edges not gelatinized; cheilocystidia absent. 59. Stem fairly sturdy (4-10 mm thick or more), white (though sometimes discolored by orange gluten), and stuffed; found under conifers; lamellar trama divergent. 59. Stem more flimsy than above (1-3 mm thick), colored, often hollowing; habitat varying; lamellar trama parallel. 60. Gills running down the stem or beginning to do so (decurrent to subdecurrent); spores 5-7 µ long. 60. Gills broadly to narrowly attached to the stem, but not running down it (adnate to adnexed); spores 6-10.5 µ long. 61. Cap orange; fresh surfaces thinly slimy. 61. Cap red; fresh surfaces very slimy. 62. Taste bitter; spores often constricted to contorted. 62. Taste not distinctive; spores more regularly ellipsoid. 63. Cap orange; appearing in spring or early summer. 63. Cap red; appearing in summer and fall. 64. Growing near melting snowbanks in western mountains; cap pink to pinkish but sometimes fading to whitish; gills pinkish; spores 12-15 µ long. 64. Not growing near snowbanks; variously distributed; cap color varying; gills variously tinted; spores variously sized. 65. Gills becoming spotted with pink and red, eventually discoloring pink to red overall; mushroom medium-sized to large at maturity (cap over 3 cm across, stem 0.5-2 cm wide) and often similar in stature to a russula; cap pink to red or purplish red--often streaked, mottled, or granulated in appearance. 65. Gills not becoming spotted with pink or red; mushroom small to large; stature varying; cap variously colored. 66. Associated with oaks and other hardwoods; gills close. 66. Associated with conifers; gills close or nearly distant. 67. Taste strongly bitter; cap readily bruising and discoloring yellow. 67. Taste not distinctive; cap not bruising yellow, or doing so slowly and faintly. 68. Gills close; stem 1-2 cm thick; cortina-like partial veil present in very young specimens. 68. Gills distant or nearly so; stem 0.5-1 cm thick; veil absent. 69. Mature cap mottled pink to reddish over a whitish ground; stem and cap sometimes bruising yellow; gills long remaining whitish; spores 8-10 µ long. 69. Mature cap more evenly reddish to pink; surfaces never yellowing; gills soon reddish; spores 6.5-8 µ long. 70. Growing in sand dunes along the Gulf Coast, in association with sandhill rosemary shrubs (Ceratiola ericoides); cap orange to red, often with a brownish center; spores 15-20 µ long. 70. Not growing in sand dunes with rosemary shrubs; variously distributed; cap color varying; spores < 15 µ long (2 exceptions). 71. Gills lavender to dull purple; cap brownish orange to orange; recorded from the southern Appalachians to Massachussetts. 71. Gills not lavender to purple; cap color varying; variously distributed. 72. Cap orange to yellow-orange, fading to pale orange or yellowish, moist, often slightly bell-shaped; gills bright orange and remaining so (contrasting starkly with the cap and stem in maturity); stem 40-100 x 3-6 mm, bald, moist to dry. 72. Cap various shades of orange, yellow, pink, and red, convex to broadly bell-shaped or flat; gills not usually contrasting starkly with cap and stem at maturity; stem varying. 73. Odor distinctive (sometimes best determined after several specimens have been placed in a closed container for a while). 74. Odor of garlic; cap small (usually under 2 cm), red to orangish red, somewhat scaly. 74. Odor not garlic-like; cap varying. 75. Odor like rotten eggs or swamp gas; cap yellow and broadly bell-shaped. 75. Odor not like rotten eggs; cap not yellow, variously shaped. 76. Odor of honey, best detected as specimens are drying or in dried specimens; cap bright orange. 76. Odor not reminiscent of honey; cap pale orange to pale pinkish orange or pinkish. 77. Recorded from the West Coast; cap pinkish; odor sickening and strongly sweet. 77. Variously distributed; cap pale orange to pale pinkish orange; odor sickening and sweet or not. 78. Under conifers; odor distinctive but hard to describe: fragrant, soapy, slightly foul; spores 7-10 µ long. 78. Under hardwoods; odor strong and unpleasant, reminiscent of the "coal tar" odor in some species of Tricholoma; spores 5-7 µ long. 79. Cap dull to bright yellow. 79. Cap red to orange. 80. Fresh cap dry to moist or greasy. 80. Fresh cap sticky to slimy. 81. Cap dull yellow to yellowish, with fine brownish to blackish scales; stem colored like the cap; often growing in clusters. 81. Cap dark yellow, bald; stem becoming pink to red near the base; not usually clustered. 82. Gills narrowly attached to notched. 82. Gills broadly attached to the stem or running down it. 83. Spores 4-5 µ wide; stipitipellis with some gelatinized elements. 83. Spores 2.5-3.5 µ wide; stipitipellis not gelatinized. 84. Cap dull brownish orange, fading to pale orange or buff, usually appressed-fibrillose; stem 0.5-1.5 cm thick; spores subglobose or very broadly ellipsoid; lamellar trama interwoven. 84. Cap more brightly colored than above (bright orange to red), bald to appressed fibrillose or scaly; stem width varying; spores varying; lamellar trama parallel. 85. Cap surface scurfy to scaly, at least over the center (use a hand lens). 85. Cap surface basically bald. 86. Odor of garlic; fresh cap bright red; spores 8-10 µ long. 86. Odor not distinctive; fresh cap red or orange; spore size varying. 87. Gills narrowly attached to the stem, or attached by a notch; cap red and tiny (only up to 1 cm across); known from the Gulf Coast. 87. Gills broadly attached to the stem or running down it; cap color and size varying; distribution varying. 88. Tips of scales on cap surface brown to brownish or blackish; growing in moss or sphagnum. 88. Tips of scales not brown to brownish or blackish; habitat varying. 89. Fresh cap orange to yellow. 90. Associated with sweet bay in the Gulf Coast region; cap color variable but usually involving red mixed with olive and/or brown; pileipellis two-layered. 90. Variously distributed; cap without olive or brown shades; pileipellis not not-layered. 91. Mature cap 0.5-2 cm across. 91. Mature cap 2-7 cm across. 92. Gills running far down the stem; cap densely (but finely) scaly; spores 9-12 µ long. 92. Gills broadly attached to the stem or just beginning to run down it; cap merely scurfy; spores 5-8 µ long. 93. Cap red; known from Tennessee and North Carolina; cystidia present; spores 11-17.5 µ long. 93. Cap orange; known from eastern North America and from Washington; spores 5-8 µ long. 94. Gills at maturity narrowly attached to the stem, or attached by a notch. 94. Gills at maturity broadly attached to the stem, or running down it. 95. Cap with a central hump or point. 96. Cap surface soon dry; gills deep orange and remaining so into maturity, contrasting with faded cap. 96. Cap surface sticky; gills yellow to pale orange, not as above. 97. Cap 2-10 cm across; stem surface becoming fibrillose to stringy with maturity; stem 6-20 mm thick. 97. Cap 3-6 cm across; stem surface not becoming fibrillose to stringy; stem 3-6 mm thick. 98. Fresh, mature cap red. 98. Fresh, mature cap orange (but cap possibly red when very young and moist). 99. Cap 2-6 cm across, dry. 99. Cap 0.5-1 cm across, sticky. 100. Mature cap 2-3.5 cm across; odor of honey (best detected as specimens are drying or in dried specimens). 100. Mature cap 0.5-2 cm across; odor not distinctive. 101. Gills at maturity running deeply down the stem; cap surface sticky; stem 1-2 mm thick. 101. Gills at maturity broadly attached to the stem or just beginning to run down it; cap surface dry; stem 2-5 mm thick. 102. Fresh stem sticky to slimy. 102. Fresh stem dry to greasy or moist. 103. Odor strong, reminiscent of almonds. 103. Odor not distinctive, or at least not reminiscent of almonds. 104. Known from the West Coast; cap reddish brown to cinnamon brown, 4-7 cm across. 104. Known from eastern North America; cap grayish brown to gray, 2.5-4 cm across. 105. Mature stem 2-5 mm thick; cap relatively thin-fleshed; lamellar trama parallel. 105. Mature stem 5-30 mm thick; cap relatively fleshy; lamellar trama divergent. 106. Cap grayish to purplish gray when young (but later usually orangish); odor often, but not always, fishy or reminiscent of burned rubber; gill edges often gelatinized; filamentous cheilocystidia present. 106. Cap brown to tan, gray, or black; odor not distinctive; gill edges not gelatinized; cheilocystidia absent. 107. Cap brown to purplish brown, fading to tan; gills yellowish to yellow; stem pale grayish, becoming yellowish. 107. Cap black to dark grayish brown or dark gray; gills white to pale gray; stem colored like the cap. 108. Cap reddish brown, tawny, cinnamon brown, or orangish brown. 108. Cap brown to yellow brown, olive brown, grayish brown, gray, or black. 109. Associated with hardwoods; young cap whitish with a reddish brown center; mature cap sometimes tawny to cinnamon brown overall, with a pale margin. 109. Associated with conifers; cap fairly evenly reddish brown throughout development. 110. Cap brown over the center but yellow brown to yellow near the margin; stem yellow to yellowish; associated with two-needled pines. 110. Cap colors not as above; stem not yellow; associated with various trees. 111. Stem with a brown, appressed-fibrillose covering (underneath the gluten) that often becomes stretched out and streaked, or chevron-like, with age. 111. Stem white to whitish or, with age, slightly brownish to grayish as the gluten dries out; bald, dotted, or fibrillose. 112. Stem apex with dot-like points that darken to brown or gray as the mushroom matures (and on dried specimens), contrasting with the stem surface. 112. Stem apex bald or with pale dot-like points that do not darken as above. 113. Stem with a whitish, appressed-fibrillose covering (underneath the gluten); cap grayish; spores 9-13 µ long. 113. Stem bald or, near the apex, dotted, but lacking a fibrillose covering; cap some shade of brown; spores varying in length. 114. Spores shorter than 10 µ. 114. Spores longer than 10 µ. 115. Under conifers; cap evenly dark olive brown to blackish. 115. Under hardwoods; cap brown to grayish brown over the center, but much paler toward the margin. 116. KOH orange to yellow on stem apex; most spores 10-15 µ long. 116. KOH reaction on stem apex not recorded; most spores 12-18 µ long. 117. Gills staining and bruising slowly pink; cap gray brown to gray or black. 117. Gills not staining or bruising pink; cap variously colored. 118. Spores round or nearly so; cylindric to subfusoid hymenial cystidia present. 118. 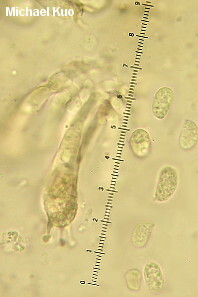 Spores ellipsoid; hymenial cystidia absent. 121. Odor reminiscent of green corn. 121. Odor not reminiscent of green corn. 122. Cap subconic to bell-shaped; gills whitish, staining slowly pink. 122. Cap convex or nearly so; gills off-white to grayish or purplish, not staining pink. 123. Cap and gills with hints of purple when young; most spores under 7 µ long. 123. Cap and gills without purple hints; most spores longer than 7 µ. 124. Odor fragrant, and/or reminiscent of almonds or cherry pits. 124. Odor foul, reminiscent of coal tar, sickening sweet, sweet, or reminiscent of raw potatoes. 125. Cap reddish brown to cinnamon brown or tawny. 125. Cap grayish brown to gray. 126. Gills yellowish when young, broadly attached to the stem or with a decurrent tooth; spores 10-14 µ long. 126. Gills white to whitish when young, truly running down the stem; spores variously sized. 127. Cap with purplish to red flushes; spores 10-14 µ long. 127. Cap without purple to red flushes; spores 7-10 µ long. 128. Spores 11-14 µ long; mature stem about 0.5 cm thick; known from the Pacific Northwest. 128. Spores 7-10 µ long; mature stem 0.5-1.5 cm thick; apparently widely distributed in North America. 129. Taste bitter; cap reddish brown to tawny over the center, with a paler margin; odor reminiscent of raw potatoes. 129. Taste mild; cap variously colored; odor not reminiscent of raw potatoes. 130. Odor sickening-sweet; cap pinkish tan to pinkish brown, with a whitish sheen. 130. Odor foul, or reminiscent of coal tar or chloride of lime; cap not as above. 131. Stem 10-20 or more mm thick; odor of coal tar; cap gray, becoming streaked in appearance. 131. Stem 1-6 mm thick; odor strong and foul, or reminiscent of chloride of lime; cap brown to gray or black, not becoming streaked in appearance. 132. Gills brown; cap striate. 132. Gills whitish to grayish; cap not striate. 133. Cap grayish brown to nearly black; gills thick. 133. Cap yellowish gray or grayish; gills narrow. 134. Fresh cap dry to moist or lubricous; pileipellis not gelatinized (or, in one species, very slightly gelatinized). 134. Fresh cap sticky to slimy; pileipellis an ixocutis or ixotrichoderm. 135. Gills orange, contrasting with the olive brown to orangish brown cap; cap often somewhat conic. 135. Gills white to gray, yellow, yellowish, brown, or brownish; cap variously colored and shaped. 136. Gills brown to brownish. 136. Gills not brown to brownish. 137. Cap purplish brown to rusty brown; spores 8-10 µ long, ellipsoid; pileipellis a cutis. 137. Cap pale buffy brown to olive brown, yellowish brown, pinkish brown, pinkish cinnamon, or gray; spores 4-6 µ long, subglobose or very broadly ellipsoid; pileipellis hymeniform. 138. Cap initially brownish yellow, becoming yellowish brown to gray; spores 5-6 x 4-5 µ, mostly broadly ellipsoid. 138. Cap pale buffy brown to olive brown, pinkish brown, or pinkish cinnamon, becoming gray to black; spores 4-6 x 4-5 µ long, mostly subglobose. 139. Cap yellowish to brownish yellow underneath a covering of fine brown to nearly black scales; gills and flesh yellowish at maturity; spores 6.5-10 µ long; distributed primarily in the southeastern United States. 139. Cap not as above; gills and flesh variously colored; spores varying; distribution varying. 140. Cap reddish brown to rusty brown, cinnamon, pinkish brown, yellowish brown, or pale olive brown. 140. Cap grayish brown to dark brown or gray. 141. Stem with shades of red and/or orange; gills orangish to yellow; spores ellipsoid; known from the Gulf Coast. 141. Stem whitish, brownish, or grayish; gills whitish to grayish; spores ellipsoid or subglobose; variously distributed. 142. Gills running well down the stem; spores 7-9 x 4-5 µ; lamellar trama interwoven. 142. Gills broadly attached to the stem or, when mature, just beginning to run down it; spores 3-5 x 3-4 µ; lamellar trama parallel. 143. 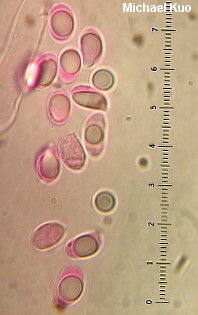 Spores 7 µ long or longer, ellipsoid. 143. Spores shorter than 7 µ, globose to very broadly ellipsoid. 144. Spores 9-14 µ long; cap finely scaly; stem fibrillose with gray-brown fibrils, 5-12 mm thick. 144. Spores 7-9 µ long; cap streaked and pruinose, but not scaly; stem not fibrillose, 10-20 mm thick. 145. Cap blackish brown (at least over the center) and scaly; spores ellipsoid (5-6 x 3.5-4.5 µ); lamellar trama parallel. 145. Cap grayish brown to gray, bald or finely fibrillose but not scaly; spores globose to subglobose; lamellar trama interwoven. 146. Stem gray to purplish gray; cap at first with a whitish sheen. 146. Stem white or nearly so; cap without a sheen. 147. Cap gray with lilac to purple shades; pileipellis often slightly gelatinized. 147. Cap gray, without lilac to purple shades; pileipellis not gelatinized. 148. Taste bitter to acrid. 149. Cap 2.5-6 cm across, purplish gray; gills running well down the stem; lamellar trama interwoven. 149. Cap 6-12 cm across, tawny brown; gills broadly attached to the stem or just beginning to run down it; lamellar trama divergent. 150. Cap conic to broadly conic; gills yellow; flesh yellow. 150. Cap convex to flat--or if cap subconic, then gills not yellow; flesh not yellow. 151. Lilac to purple shades present on fresh cap or fresh gills. 151. Lilac to purple shades absent. 152. Fresh gills purplish; cap gray-brown; spores ellipsoid and amyloid; lamellar trama red in KOH. 152. Fresh gills white to grayish; cap purplish gray; spores subglobose and inamyloid; lamellar trama not red in KOH. 153. Cap reddish brown to cinnamon brown or pinkish brown. 153. Cap dark brown to grayish brown, gray, or olive brown. 154. Cap reddish brown fading to brownish, bald; stem bald; gills close or nearly distant; lamellar trama interwoven. 154. Cap pinkish brown to pale cinnamon, with an appressed-fibrillose to cottony margin; stem with a pruinose to hairy apex and, often, with remains of a cortina-like veil; gills close or crowded; lamellar trama divergent. 155. Gills running well down the stem; cap olive brown, lubricous, soon dry; lamellar trama interwoven; spores 7-9 µ long. 155. Gills broadly attached to the stem or just beginning to run down it; cap gray to brown, slimy when fresh; lamellar trama parallel or divergent; spores variously sized. 156. Lamellar trama parallel; cap margin becoming somewhat translucent-striate; cap often darker over the center; known from the West Coast. 156. Lamellar trama divergent; cap not becoming translucent-striate; cap evenly colored or darker over the center; variously distributed. 157. Spores 9-13 µ long; stem with gray fibrils. 157. Spores 7-11 µ long; stem with or without gray fibrils. 158. Stature reminiscent of a Tricholoma; cap streaked; gills pale to dark gray; stem bald or nearly so. 158. Stature more collybioid than tricholomatoid; gills white to whitish; stem fibrillose. Arnolds, E. (1990). Tribus Hygrocybeae. In Bas, C., Th. W. Kuyper, M. E. Noordeloos & E. C. Vellinga (1990). Flora Agaricina Neerlandica: Critical monographs on families of agarics and boleti occurring in the Netherlands. Volume 2. Rotterdam: A. A. Balkema. 70-133. Arnolds, E. (1995). Hygrophoraceae (Agaricales) in New York state and adjacent areas. 1. Introduction and Hygrocybe subsect. squamulosae. Mycotaxon 53: 1-27. Bessete, A. E., W. C. Roody, W. E. Sturgeon & A. R. Bessette (2012). Waxcap mushrooms of eastern North America. Syracuse: Syracuse University Press. 179 pp. Bird, C. J. & Grund, D. W. (1979). Nova Scotian species of Hygrophorus. Proceedings of the Nova Scotia Institute of Science 29: 1-131. Boertmann, D. (2000). The Genus Hygrocybe. Denmark: Danish Mycological Society. 184 pp. Boertmann, D. (2008). Hygrocybe (Fr.) P. Kumm. In Knudsen, H. & J. Vesterholt, eds. Funga Nordica: Agaricoid, boletoid and cyphelloid genera. Copenhagen: Nordsvamp. 194-212. Cantrell, S. A. & Lodge, D. J. (2004). Hygrophoraceae (Agaricales) of the Greater Antilles: Hygrocybe subgenus Pseudohygrocybe sections Coccineae and Neohygrocybe. Mycological Research 108: 1301-1314. Cibula, W. G. (1979). Fungi of the Gulf Coast I. Two new species of Hygrophorus Section Hygrocybe. Mycotaxon 10: 105-115. Cibula, W. G. & Weber, N. S. (1996). Hygrocybe andersonii a new psammophilus Hygrocybe from Horn Island, a Mississippi barrier island. Mycologia 88: 514-516. Hesler, L. R. and Smith, A. H. (1963). North American Species of Hygrophorus. Knoxville: U Tennessee P. 416 pp. This book is available online here, at the University of Michigan. Kovalenko, A. (2008). Hygrophorus Fr. In Knudsen, H. & J. Vesterholt, eds. Funga Nordica: Agaricoid, boletoid and cyphelloid genera. Copenhagen: Nordsvamp. 212-223. Largent, D. L. (1985). The Agaricales (Gilled Fungi) of California. 5. Hygrophoraceae. Eureka, California: Mad River Press. 208 pp. Larsson, E. & Jacobsson, S. (2004). Controversy over Hygrophorus costa settled using ITS sequence data from 200 year-old type material. Mycological Research 108: 781-786. Lodge, D. J. & D. N. Pegler (1990). Hygrophoraceae of the Loquillo Mountains of Puerto Rico. Mycological Research 94: 443-456. Lodge, D. J., M. Padamsee, P. B. Matheny, M. C. Aime, S. A. Cantrell, D. Boertmann, A. Kovalenko, A. Vizzini, B. T. M. Dentinger, P. M. Kirk, A. M. Ainsworth, J. -M. Moncalvo, R. Vilgalys, E. Larsson, R. Lucking, G. W. Griffith, M. E. Smith, L. L. Norvell, D. E. Desjardin, S. A. Redhead, C. L. Ovrebo, E. B. Lickey, E. Ercole, K. W. Hughes, R. Courtecuisse, A. Young, M. Binder, A. M. Minnis, D. L. Lindner, B. Ortiz-Santana, J. Haight, T. Laessoe, T. J. Baroni, J. Geml & T. Hattori (2013). Molecular phylogeny, morphology, pigment chemistry and ecology in Hygrophoraceae (Agaricales). Fungal Diversity 64: 1-99. Miller, O. K. Jr. (1984). A new species of Hygrophorus from North America. Mycologia 76: 816-819. Mitchell, D. H. & Smith, A. H. (1975). Notes on Colorado fungi I. Hygrophorus amarus. Mycologia 67: 672-674. Montoya, L., V. M. Bandala & D. Jarvio (2005). New records of Hygrocybe from the Gulf of Mexico area. Mycotaxon 91: 471-480. Montoya, L. & V. M. Bandala (2007). Hygrophorus virescens is transferred to Hygrocybe. Mycotaxon 99: 345-346.